Alright everyone, here are four songs that I am making downloadable on this website, just for you. Two of the songs are from brother Viet Khang, the heroic prisoner of freedom, justice, and human rights. The next two tracks are from Mr. Truc Ho, the great crusader, who has fought tirelessly to raise the human rights issue, and mobilize us Vietnamese across the seas. Both of these men are great musicians, composing extremely powerful songs that have left the Communists shaking in their little boots. The list presented below includes Truc Ho’s popular song, “Dap Loi Song Nui,” which translates to “Answering the Call of the Mountains and Rivers.” This song was composed earlier in 2008, though I have yet had the opportunity to share it with you. Any fans of Truc Ho surely know about this song already. However, if you have not listened to it yet, now is as good a time as any. Viet Khang – Viet Nam Toi Dau? Viet Khang – Anh La Ai? To download the songs above, simply right click on each file, then choose the “save link as” option on your computer. The next step is self explanatory: click “save,” or “download,” whatever it is that comes up at this point. These steps apply both to Macs and PCs, as the process and results will be exactly the same. To my users outside of North America, Vietnam especially, choose the corresponding options in your language and you too should receive the songs. From here, do as you please with the music. Listen to it, enjoy it, and share it with the world. To my people in Vietnam who are able to access this blog, here is your chance to acquire what your government has been trying so hard to shield from you all this time. Take this music, spread it as far and wide as you can, by whatever means at your disposal. This is only a small step, but it’s a small step forward. The world is with you, may you never give up. For the past couple months, Mr. Truc Ho has been conducting yet another brilliant campaign for human rights in Vietnam. This most recent campaign is called “Million Hearts, One Voice,” and has caused quite a headache for the Communist leadership in Hanoi. Not only did Truc Ho present a petition with over 135,000 signatures to both American and U.N leaders about Vietnam’s human rights issue, he also crafted a beautiful new song to support his campaign. One of the flagships of Truc Ho’s campaign, next to his petition, is his newly composed song, “Trieu Con Tim,” or “A Million Hearts.” Trieu Con Tim is a finely crafted song that vividly describes the countless abuses and failures of the Communist Party in Vietnam. Their pathetic display on the world stage, especially their kowtowing to Beijing and the CCP, as well as their pathetic displays at home brought to light. The song mentions some specific cases that happened recently in Vietnam. 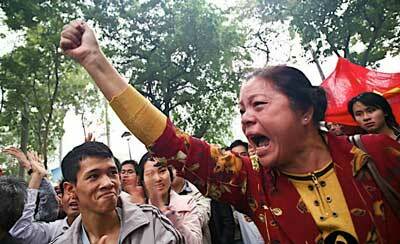 One such case is the self-immolation of a mother in protest of the Hanoi government. As a blogger, her daughter was detained as result of her courage to criticize the party. Other cases, such as the government’s seizing of a citizen’s property, and the losing of Paracel and Spratly are also mentioned. These stories will be mentioned in more detail in future posts. This campaign has made a huge impact America’s new foreign policy towards Vietnam. The Obama Administration’s Vietnam policy has shifted dramatically, and relations between the two nations have begun to deteriorate. The U.S. has become fed up with the lack of progress on Vietnam’s human rights situation. Therefore, they no longer seek to strengthen relations with the Communist Vietnamese. This recent development will too be covered in a follow-up article. For now, if you haven’t already, give this song a listen, enjoy it, and think about the message that it is delivering. In the near future, I will write an article that gives everyone an opportunity to download the music of Truc Ho, as well as the music of Viet Khang. This will make it possible for anyone who has access to this blog, whether inside or outside of Vietnam, to download the music and circulate it where ever they feel necessary. Until then, hang tight, my fellows, and stock up on some blank CD’s.